Ever wonder just what low T does? And how far down your testosterone can go before it causes issues or even permanent damage? Some of you have been told, "Your testosterone is not that low - don't worry about it!" All you know is that you still feel lousy and don't know why. 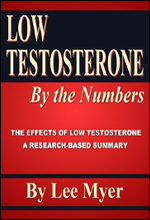 This book will show you what the research has to say and why low testosterone affects men so severely. The risks from low T for hardening of the arteries, erectile dysfunction, diabetes, insulin resistance and many more conditions are all examined. In fact, over 50 studies on low testosterone issues will be summarized along with a discussion of the corresponding testosterone level. The author is Lee Myer, creator of the popular men's web site, Peak Testosterone.